The ‘Settings’ sequence presents a chain of backdrops against which personal happenings and dramas were played out. Within the dynamic period preceding Seeing Things when Heaney deliberately swooped on anything that stimulated memory or association (DOD 320), he allowed himself to be transported back by the poems that ‘came on’ to the sites, moments and emotions of previous experience, from where he weighed up what ‘in time … was extra, unforeseen and free’ (Markings I). Recalling a symposium (Heaney does not tell us when or where) of specialists and literary figures Heaney recounts an excursion – the poet identifies Danish poet Ivan Malinowski on the same tour whose death in 1989 introduces an short Heaney-style tribute to a kindred spirit. Later mention of the emblematic figure of an Icelandic poet and mythologist, Snorri Sturluson’ gives the general location away. The outing provides an Icelandic context (saga country) and features two poets, himself and Malinowski, ever alert to instances with poetic charge. 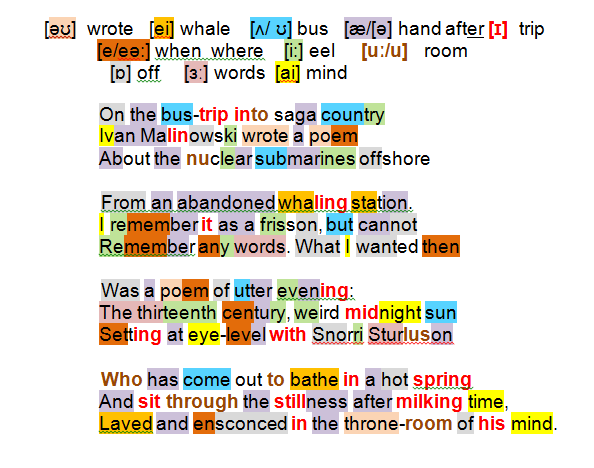 The Dane’s poem reflects post-war militarism and loss of ancient traditions (nuclear submarines … an abandoned whaling station). Heaney, thrilled (frisson) but paying only half attention to the content, is on a different tack: looking to seize the pure essence of a moment (a poem of utter evening) set in a different age (thirteenth century) against the ageless backdrop of high latitudes in summer (weird midnight sun setting) and in the presence of an iconic Icelander (at eye-level with Snorri Sturluson) as he savours a moment of hydrothermal bliss (bathe in a hot spring) and relaxes undisturbed after his day-job (milking time) beneath a warm shower (Laved). The moment offers Sturluson time and space to pursue the majestic thoughts of a man who was both poet and leading statesman (ensconced in the throne-room of his mind). Snorri Sturluson (1179 –1241) Icelandichistorian, poet, and politician; elected twice as lawspeaker at the Icelandic parliament, the Althing; author of the Prose Edda or Younger Edda, which consisting of a narrative of Norse mythology, the Skaldskapormal, a book of poetic language, and the Hattotal, a list of verse forms.